You may be wondering why I haven’t written a piece in over a month? Or you may just be happy to hear from me (I hope it’s the latter). Social media activity has been minimal for the last month; this is due to the new adventure I mentioned last time out. All I can reveal about the new adventure is that it has been successful, I had to dedicate most of my time to prepare for it as I wanted to give it my all and have no regrets! I promise I will stop talking in a roundabout way very soon and reveal exactly what has been going on! Ok, so what have we been up to? 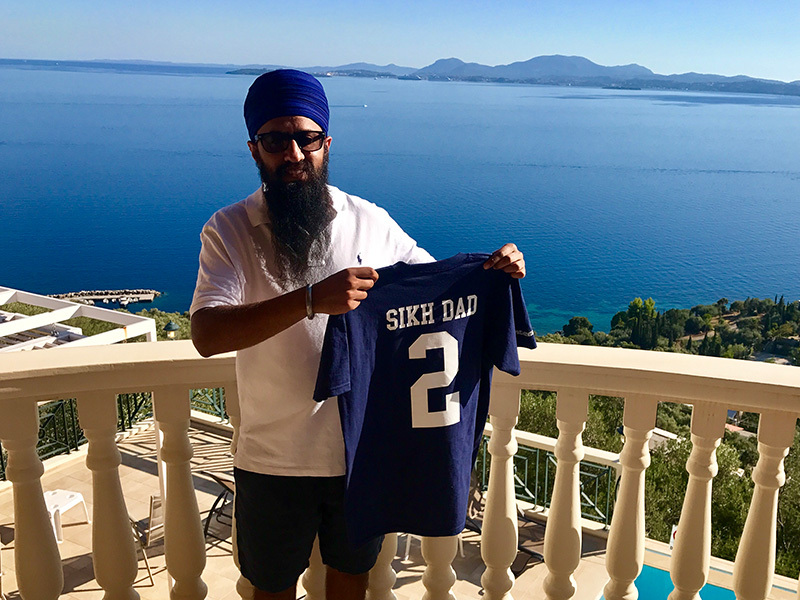 Well, some of us Sikh Dads appeared on the time to change site https://www.time-to-change.org.uk/change-makers when we partook in the recent event. What we do is either at dinner or before we sleep we reflect on our day as a family. We each have to say three things that we have done or felt in the day. We also have to ask one question to each person. We have done this for a while now, and it’s become apart of our family routine. It’s so important we talk and communicate with each other as we can easily take each other for granted! We were inspired to join in by Taraki, who as you know I have mentioned before. This month’s Chai in the City open forum I had the opportunity to be their “guest speaker” It was a big honour for me to talk amongst my brothers about areas of my life that had shaped who I am today. I was open and honest about mental health, marriage and family. I was overwhelmed by the response from the attendees, and we delved quite deep into many community issues and expectations in the Q and A, I certainly left the session having learnt a lot about myself and the experiences of others. Elsewhere MK has been upping her game in preparation for her 11 plus later this year, at the moment she has one tuition session a week, but as it was half term, there was a special 11 plus mock exam available. We discussed it with her and all agreed it would be a great way to measure where she is at? She had never sat for so long in an actual test environment so it was a win-win situation. She prepared for it really well, and we were both proud of her effort, she also did a lot better than expected so we all have a lot to work on with her moving forward. Anyone in a similar situation, please do reach out, I am sure we could learn a lot from each other’s experiences as it’s not easy! My parents held a blessing programme for us at our local place of worship (Gurdwara); this is something they have regularly done in the past, however this time we were double booked with kids kickboxing gradings. I’m sure you have all seen on IG they were successful in their grading’s, but that meant one of us going there and one of us staying at the Gurdwara, why am I telling you all this? The reason is I stayed at the Gurdwara with Gobind Singh on my own for around 1.5hrs, I fed him, played with him and put him to sleep all in front of the watchful eyes of the congregation. Now I know things are improving and many dads are already taking the lead, but in our places of worship, there is still that mentality of where is the mum? Or are you ok with him? Shall I take him? Can you manage? All in a nice way but in the past, I may have been inclined to others to help out with kids, but not now, I have developed this belief and confidence over the last few years that I can handle most situations as a father (He says). A special mention has to also go to Gurleen’s class teddy “Cherry Bear” who blessed us with his presence over the half term week. Usually, it’s normally a weekend stay, but I guess we hit the jackpot, she was over the moon. We had spoken about this for a long time as she kept on mentioning that her turn was not coming, so I asked her what she needed to do to get the opportunity to host our furry friend (other than kidnap him) yes I am joking! She said she needed to learn to write her name, do good listening and improve on her phonics, so that’s what we did. I went to pick her up on the Friday before half term which I don’t normally do due to work commitments. The Teacher called her name, and I was wondering what was taking her so long, then all of a sudden she appeared shouting “Daddy Daddy I got cherry bear” I won’t ever forget that as we both laughed so loud other parents must have been wondering what had happened, but for us it was a great achievement. Since then we have spoken to the teacher who was looking for a good home for cherry bear throughout the half term; apparently, we fitted that description! After an action-packed week, our furry friend is now safely back in the hands of the school. Chickenpox was going around at school and as you would have seen Gurleen came into contact with it. It didn’t last as long as we thought but she was very brave throughout and managed it really well, we were naturally nervous of Gobind Singh catching it from her and our fears where confirmed when his face was covered in them, yes he had it really bad the poor thing is only 8 months old, he struggled to eat, sleep etc. But he continued to smile, that’s something I have learnt from my kids to have no fear, be brave and continue to smile no matter what! Finally ending with some still or fizz?? Yes fizz free Feb was going great, it had been over 3 weeks of no fizzy sugar filled pop, there had been the odd days of cravings but I managed to stay strong that was until Sat 23rd when a late night drive to Cov from London required something that the Dr literally ordered, now I know what you are all thinking! Yes, I can confirm it was a bottle of Dr Pepper that helped me keep awake and made sure I arrived safely at the hotel. That was, of course, my fizz free Feb over, it was good while it lasted and I am sure I will do it again in the future, most probably when I require some still in my life but for now I will keep a bit of fizz! This week started with a new adventure for me, something I have wanted to do for a while. It may not have been presented to me in the format I was expecting, however, I trusted my instincts and went with it. You are probably thinking “What is he on about?” I’m afraid I can’t say any more on this at the moment, but you will be the first to know as I have been supported and inspired by so many of you. One new adventure I can tell you about is my up and coming shared paternity leave, the forms have now been submitted! I am looking at having anything between 2-3 months starting from April. We have spoken to quite a few couples that have done this and they have all said its the best thing they ever did! Of course, I know it will be a challenge, NK has already started preparing me with “What if” scenarios and as we know there will plenty of those with 3 kids to manage. I am expecting the time to fly by as anyone who does a school drop off and pick up will know there are very few hours in between, which normally zoom by! I will plan to make the most of the time that I do have and I am really looking forward to the challenge of being a full-time dad. The options were not here four yrs ago when GK was born, more and more are taking the opportunity now, so why not?? As a team, they are passionate about getting Punjabi/Sikh men to open up about anything ranging from everyday issues to mental health illnesses. We all know that as a community we have been pretty bad at this over the years. Putting that to one side I am noticing a change that goes hand in hand with the rise of public awareness around mental health. It was a really positive evening and I am sure we will see more of these pop up all over the country. These guys are doing amazing work, I am honoured to be a part of this and urge you all to support them in any way that you can. We all have a guvnor in our house, but now she officially has the title of school governor, yes NK has been successfully voted in as the new parent governor in the kid’s school. I always knew she would get it, however, she was playing it down (I bet she hasn’t even told any of you yet?) well you all know now! I am so proud of her and know she will be great, she has invested so much time in building a relationship with the school over the years that she deserves this opportunity, I know she will enjoy all the meetings as well! Finally, those that would have seen my IG story from the other day will know about our boiler. Our Sikh dad came to the rescue in the early hours of the morning It was my turn to ask dad “why do boilers always fail in the winter when you need them the most?” Dad replied “That is because in the winter they do the most work” I was reassured but cold, I thought about all those who literally sleep out in the cold night after night, it certainly makes you feel grateful for the things you normally take for granted. Normal order has now been restored but its a hard financial hit during maternity leave, but o well, we all know things could be much worse! I had not been to a Sikh camp for over six years, so to say I was looking forward to the Khalsa Family retreat was an understatement! It was held during the Xmas holidays, beginning on Thu 27th Dec and running until Sun 30th Dec and our first ever camp together as a family. The campsite was in Yarnfield, which is a village in Staffordshire, with stops and all it took us about four hours from London. Upon arriving, we received our room keys and transferred our luggage in time for the introduction speeches. Looking around at the time it was great to see some familiar faces but also plenty of new faces; I was keen to make new friends as those that I was familiar with were already my friends. After the entertaining intro speech, we had a tour of the site and all of the facilities available to us. The breakfast and lunch area was all very open and spacious, with our accommodation only a short walk away. Once completed we were ready to go into the Darbar (court) where we would meet Sri Guru Granth Sahib ji (living Guru of the Sikhs), and the retreat would officially begin! I had spoken to the kids before arriving about the most important part of the camp, that was the Sangat (company) of Guru ji, being in their presence for a few days non-stop is an amazing experience full of positive energy and blessings that I wanted us to take full advantage of. That positive energy that I was referring to was most definitely felt during the evening programme that night; the kids were given full reign with adult supervision to run the show, at times it was raw, pure and full of innocence. Fellow parents were looking at each other with smiles on their faces as they were experiencing something special, it was amazing to see the confidence of the young kids, they were trying new things, some were naturally making small mistakes but were not phased and carried on trying. After Langar (food) was served there was time for a small family activity before lights out, each family sat on their own table and asked each other set questions, it turned out to be vital for us as MK (our eldest daughter) was able to open up about some of her feelings. Like any other camp, the morning was dedicated to Vaheguru meditation and the Prakash (installation) of Guru Granth Sahib Ji, there was also a compulsory kid’s meditation that took place between 7 am, and 8 am. After breakfast it was time for the workshops to begin, this was the first time that there were no lectures, just workshops. Our group attended the following workshops throughout the retreat: The power of Gurbani, Spiritual Health Parenting in the 21st Century, The Gift of Love, Family routine and Teamwork makes Dreamwork. The group’s numbers were designed to be small and personal, and I feel like we went on a journey with our group, from the first workshop we were all open with each other, we shared experiences, highs and lows, by the end of it all we had all become pretty close. In my opinion, the workshop system worked as it created such an open and relaxed environment where we all became familiar with each other, the formal lecture would not have had the same effect. While parents were busy in the workshops, their kids were being looked after in the crèche along with various other group splits leading all the way up to teenage years. For us, it was nice to be able to focus and contribute as much as possible knowing that our children were safe and also learning. We would meet them after our sessions, and they would be so excited, bubbling with things to tell us. They learnt about the Chaar Sahibzahdey (4 Sons of the 10th Guru), Sikh virtues and built lego using the darbar sahib and Akaal Takht kits. They also rehearsed a play that was a total surprise to us, considering such little preparation time, the kids performed on the last day in front of us parents. The performance was based on the battle that Sikhs faced in India when the Mughals were in power. It was narrated so well, and with all ages from teenage to toddler level participating, at a time when most of our children are performing in their school nativity plays, it was nice for them to get this unique opportunity to perform in one based on Sikh history. Activities included the traditional bouncy castle; a great gatka demo and a fantastic animal show that I managed to go live on Instagram with! There was also some time to refresh and relax, generally catch up with people, that you usually only get to say hi and bye too. The organisers arranged a family photo shoot which was indeed well received; I have put up a separate post on my IG relating to this experience. Before attending the retreat, I had thought four days was a long time, but it went so fast, I am sure I am not the only one that felt that the old saying time flies when you’re having fun comes to mind. The kids loved it and didn’t want to leave! One common thing I have been asked by people who have not attended these kinds of events before is “Would I fit in?”. I got the feeling from those people that they did really want to come but something was holding them back, the fear of the unknown. The reality is there are no unknown concerns these days as I pretty much filmed the whole thing on my IG story so all could see what was going on (still available as a highlight on my IG profile page). Everyone is there for the same reason, the benefit of their family, that’s why they have taken the time out to attend. We are all on a journey, some are at different stages but what was clear to me was, if you are looking to improve and to be inspired you will find that company you are searching for in the Guru and the Sangat. I hope to see you all there next year!